One of the perks of purchasing a new vehicle is getting to enjoy that undeniable new car smell. Some new electronic devices, like a MacBook Pro, apparently give off a distinctly unique odor of their own. It’s that scent that mobile accessory maker Twelve South claims to have “bottled up” and is now selling in the form of a candle. 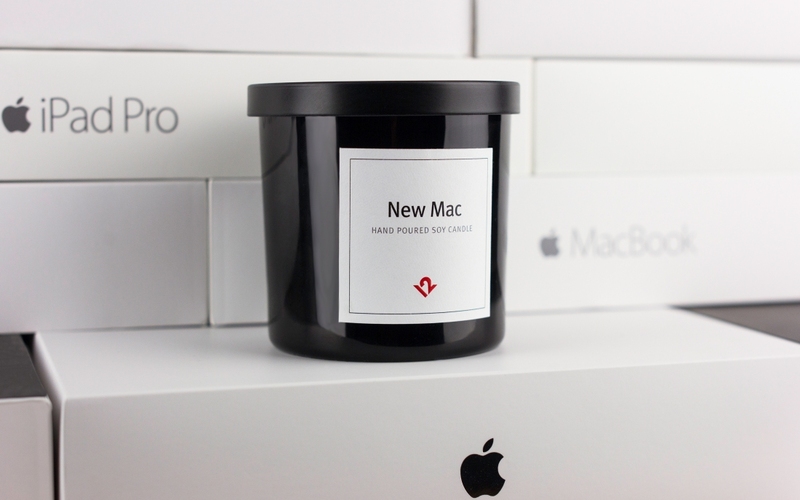 Twelve South, which got its start in 2009, says on its New Mac Candle product page that the candle exhibits hints of mint, basil, peach, mandarin, sage and lavender which somehow mesh together to create the scent you get when unboxing a new Mac (you can’t make this stuff up). It’s unclear how Twelve South came up with this concoction of ingredients. Perhaps the team used the Madeline odor camera profiled here a few years back? The candle, hand-poured in Charleston, South Carolina, is made of 100 percent soy wax with a burn time of between 45 and 55 hours. It’ll set you back $24 and judging from the fact that it’s currently out of stock, it must be pretty popular. Twelve South says it expects more inventory to arrive later this month. With the holiday season rapidly approaching, this could make the perfect stocking stuffer for the diehard Apple enthusiast in your life.